I like books I become obsessed with. Books that weave themselves into the fabric of my days, that haunt my thoughts, that nudge me – ‘read me! Read me!’ – until I stop what I’m doing to scoop them back up. Daphne du Maurier’s Rebecca is one of this rare breed. Months after reading it, I still can’t seem to get it out of my head. The novel, narrated in elegant first-person prose, follows the recollections of a shy young woman working as a lady’s companion in the South of France. Her life changes completely when she falls in love with Maxim de Winter, a handsome widower who, it is rumoured, ‘can’t get over the death of his wife’. When Maxim suddenly proposes marriage, the heroine accepts and is whisked away to England, to Manderley: Maxim’s house by the sea. In this mansion full of secrets, the new ‘Mrs de Winter’ tries to settle into the rhythm of her new life. However, it soon becomes apparent that life at Manderley is not the happily-ever-after she has been imagining. Painfully in love with a man indifferent towards her, scrutinised, from every angle, by the sinister housekeeper, Mrs Danvers, the narrator’s flaws and feelings of inadequacy are laid bare. Every day is a reminder that she occupies a space once belonging to another: everything in this house whispers of Maxim’s dead wife – Rebecca – a woman that everyone seemed to adore and who – the narrator fears – Maxim still seems to love. ‘Absorbing’, ‘enthralling’, ‘thrilling’: when trying to pick words to describe Rebecca, I find myself reaching for ones like these. It is the sort of book I talk about in capital letters (‘It’s AMAZING!’ I say to anyone willing to listen. ‘You HAVE to read it!’). I think part of this frenzied emotion comes from the fact the book is so exciting. Mystery and uncertainty linger on every page, unspoken rules that the bewildered narrator keeps breaking by accident: rooms she is not supposed to wander into, questions she is not meant to ask. ‘I must not think of that,’ she writes at one point, after allowing her imagination to stray. ‘Put it away. A thought forbidden, prompted by demons.’ The breathlessness with which she tells her story creates a drumming sense of momentum and suspense, meaning that, when I read the novel this summer, I finished it over a single weekend – I couldn’t put it down. 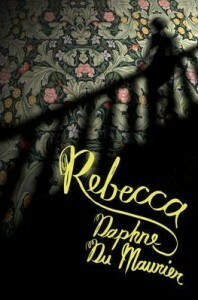 It is not simply the desire to know ‘what happens next’ that makes Rebecca such an absorbing read, however. Du Maurier’s flowing, often lyrical prose is rich in sensual detail, meaning the world she creates is intensely vivid: it is one that we can feel, see, taste, touch. The texture of the leather seats in Maxim’s car, the salty sea air that blows towards Manderley, the tangerine that leaves a sharp taste in the narrator’s mouth: her use of details engage the senses, drawing us deep inside the story. It is this impression of closeness that I love about Rebecca. While the narrator never discloses her name, every moment in the novel is written through this character’s experience, creating intimacy. Extremely self-critical, she thinks of herself as awkward and dull, especially in comparison to the sparkling Rebecca. However, her inner world is passionate and deeply imaginative. In each paragraph, du Maurier slips effortlessly between the narrator’s observations, reflections, sensations, and actions creating the rhythm of thought, as though we are inside her mind – seeing and feeling that which she does – and the sense of intensity this brings is intoxicating. Posted in Arts and tagged BOOKS, essential read. Bookmark the permalink.